First off, may I direct you to the mp3 blog, Shake Your Fist, where I was asked by the lovely Amy to write a guest post about music. I LOVE music but haven’t written about it in ages, so it was a bit nerve-wracking and I was sure the moment that I finished the post I’d be hit with regret for not including this song or that song. But it was a fun post to write and thank you to Amy for asking! It’s summertime and the living is easy. I may drink my coffee hot in the morning, but by the afternoon, I take any leftover coffee out of the fridge and serve it up right. A little simple syrup (which is just equal parts water & sugar that have been boiled together), some milk and lots of ice and I’ve got a drink that Mr. Brown would be proud of. Another thing I can’t get enough of are popsicles. 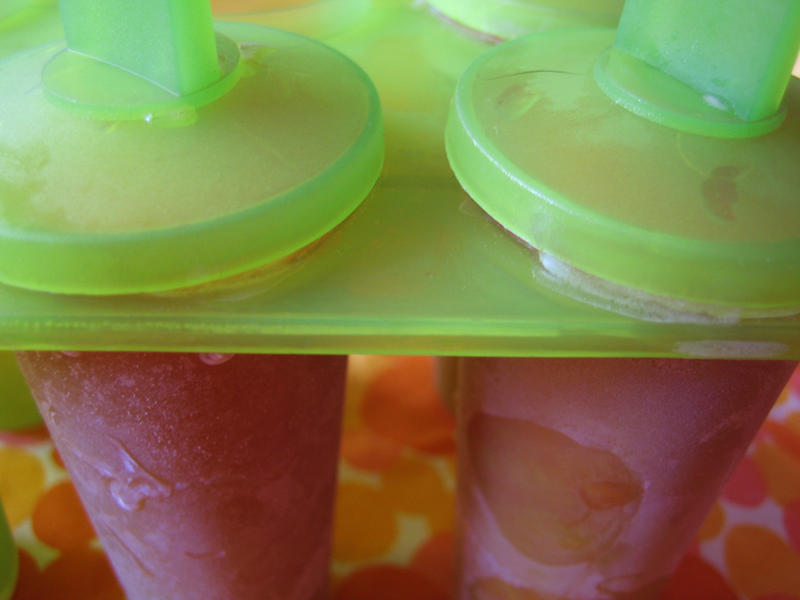 At all times, our fridge is stocked up with these homemade icy treats. I wrote about these last summer and I feel it’s time again for a refresher, because they are beyond simple to make and so refreshing. Last time I added some vanilla yogurt for creaminess, this time I just blended up some frozen strawberries, pineapple juice and fresh lime juice, poured the mix into molds and into the freezer they went. Yum. It was such a pleasure having you guest post–thanks loads for doing it! thanks amy! it was fun. i think so too, crystal! i felt it was kind of lame talking about popsicles and iced coffee but i couldn’t let that photo go to waste! Just dropping by to let you know that I tried making my own iced coffee after I saw this post and that it was wonderfull. It would never have occured to me to use syrup instead of just sugar, but it certainly makes a difference though.